MUM is not currently accepting applications for this track. Below is an overview of past iterations of the Film Track and is subject to change for future entries. Email mfafilm@mum.edu for updates. This is a new program which is a variation on the original track of the David Lynch MFA Film Track in which students conceive of and create their own individual thesis films. This new MFA in Film program — the TV Pilot MFA in Film Program — is currently in development. This will be a four-semester program with a focus on writing a full-length TV Pilot, and then each student will produce their own ten-minute version of their TV Pilot as their thesis project. This track will be expanded to a four-semester format in order to give students a balance of meditation classes, advanced TV-Pilot screenwriting classes, in-depth instruction of production techniques, and project time. The first semester focuses on learning the practice of Transcendental Meditation and advanced screenwriting, the second semester focuses on instruction in a variety of production techniques and skills, the third on the actual pre-production and production of each student thesis film, and the fourth semester on editing and post-production. It is anticipated that the two production semesters will be held in the Hollywood area, while the first and fourth semesters will take place on-campus in Fairfield Iowa. Consciousness is the basis of creativity. 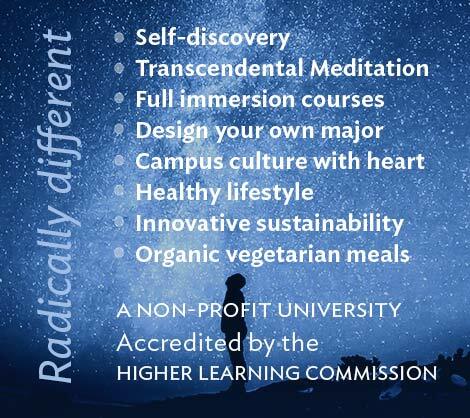 In the first course at the university students will explore consciousness within themselves by learning to practice the Transcendental Meditation® technique, if they haven’t already done so, and will be given practical tools in understanding consciousness—the Self—as the basis of filmmaking. The class will be introduced to MFA faculty and staff and given a detailed overview of the entire program. Students will then be split up into small groups and collaborate on short films. While working together, they’ll get to know their classmates’ strengths and personalities and familiarize themselves with the available equipment. Each student will begin developing the concept of his or her thesis project and flesh it out by creating character arcs, story outlines, and beat sheets. Students will learn how to give and get feedback on their work in class discussions lead by MFA faculty with the aim of elevating each student’s concept to its highest potential. First drafts will be due on the last day of the course. Students will complete and improve upon their first drafts with ongoing instruction from MFA faculty, class discussions, and script notes from faculty, staff, and classmates. Second drafts will be due on the last day of the course. Students will complete and improve upon their second drafts with ongoing instruction from MFA faculty, class discussions, and script notes from faculty, staff, and classmates. Third drafts will be due on the last day of the course. Students will spend this block polishing their existing scripts and adding the final touches with continued guidance and input from MFA faculty. Final drafts will be due on the last day of the course. In this Forest Academy course, students will explore the connection between consciousness and filmmaking. 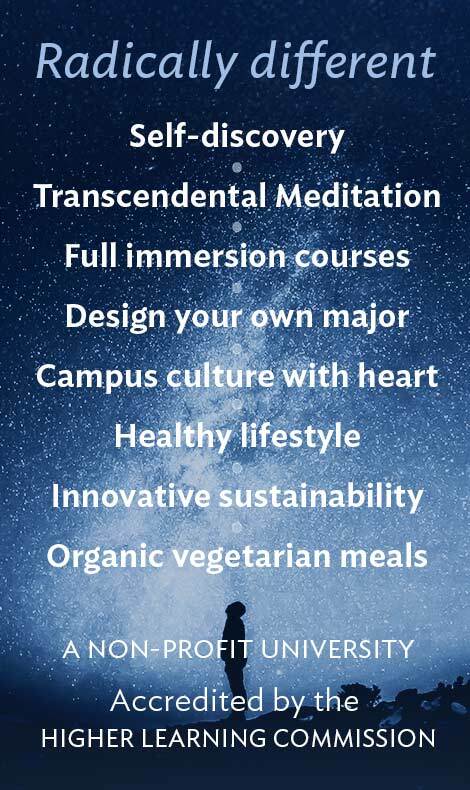 This will be accomplished through a series of film industry guest lecturers, creative exercises, short film analysis, and Maharishi tapes on creativity and consciousness. Included in the course is a three-day TM retreat, specifically geared towards the David Lynch MFA in Film students. Students will begin pre-production toward a major project (or several projects) with continuing advice, mentorship, and guidance from faculty who will help them get “green-lit” through the department. Students will work on a major project (or several projects) with continuing advice, mentorship, and guidance from faculty. The course structure will replicate the internal operations of a movie studio, further preparing students for their career after graduation. Thesis film projects can be narrative, documentary or experimental. Same as Thesis Film Project 1 and 2.